Football charm of Palmer W. Hargrave. Sent by his daughter Marian in 2017. One of the delights I take in the work here in the Archives at Wabash is the care and keeping of the artifacts in the collection. Gifts from alumni, or their families or even from someone with no connection to the college come to the Archives. All have in common the idea that the item should be here for safekeeping. So it was with this little beauty. Described in our catalog as follows: Miniature copper football engraved – Wabash Class 1909 on one side and J. W. Hargrave on the other. 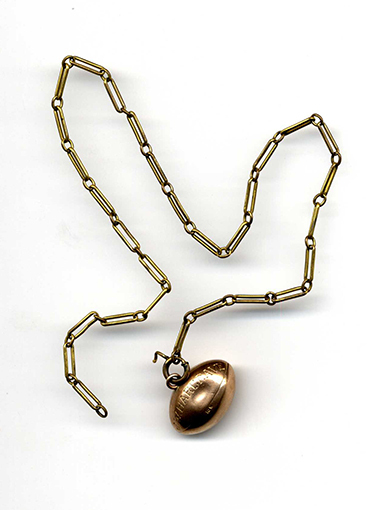 Football has a bail for the threading of a chain. Attached is a brass chain, all in a box from a jeweler in Los Angeles. This charm belonged to Palmer W. “Jack” Hargrave and came to Wabash from his daughter who sent it to President Hess for deposit in the Archives. 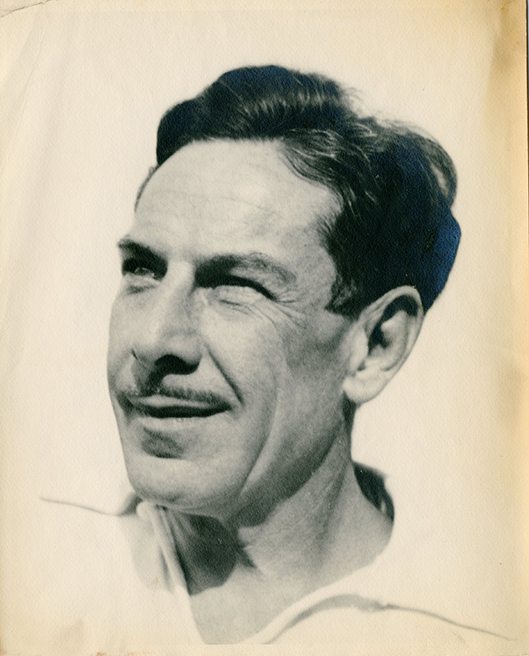 What it prompted was a correspondence and additional gifts of photographs and letters which, combined with what we already knew, create a picture of a life well lived. Indeed, this little charm points us to a legacy that continues well beyond the death of its owner. Jack, as he was always known on campus, was the oldest of five children. His father was Arthur A. Hargrave, a member of the Wabash class of 1881. 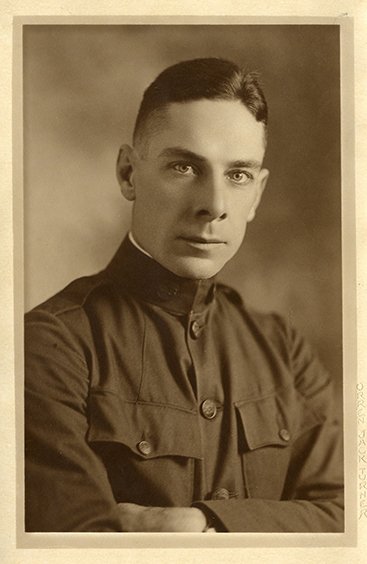 A newspaperman on his graduation, Arthur found his way to the Middle East as a printer with a Presbyterian mission. While there he married Marian Moore of Illinois and they had their first child, Palmer, born in Persia. Not long after the birth, the young family returned home to the Midwest. Arthur worked for the Terre Haute Express, an Indiana paper. Shortly thereafter Arthur bought the Rockville Republican, a local weekly. For the rest of his life he never missed writing his weekly column. At the age of 97 he was awarded an honorary degree from Indiana University. When he died in 1957 at the age of 100, he was still the publisher of this small town paper. Arthur A. Hargrave is a member of the Indiana Journalism Hall of Fame. As to that boy born in Persia, Palmer W. Hargrave seems to have lived what we might call a charmed life. Raised in the small town of Rockville along with his two brothers and two sisters, Palmer was a gifted athlete with a seemingly sunny disposition. From letters here in the Archives one gets the impression that he was one of those fellows that everyone is drawn to and likes immediately. As he was always known as Jack on campus, so it will be in this post as well. Jack was a talented athlete, as mentioned above, but he was also a pretty darned good musician as well. While other fellows might be sweeping floors or stoking the coal furnaces, Jack earned his money by playing the clarinet for local dance bands. He pledged the Phi Gamma Delta fraternity when it was brand new to the business of communal living. In one letter Jack explains that to really focus on his German grammar, he got up early to study as the house was pretty noisy outside of study hours. Clearly he did work hard at football as in his senior year he is the quarterback of the team. Writing to his parents at the start of October of 1908, he is a busy fellow. “Football takes an enormous lot of time, so with my house duties, you see something must come secondary. However, I’m getting along all right and I enjoy my course[s] very much this year. Photo of Jack, in his senior year as quarterback for the 1908 team. Following his stellar career at Wabash, Jack migrates to the west coast. This next series of images are all from the family. 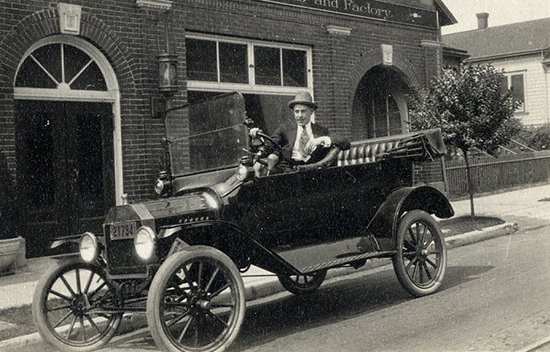 Here we have a picture of Palmer in Portland, Oregon in 1910. He looks healthy and happy, full of enthusiasm and optimism. 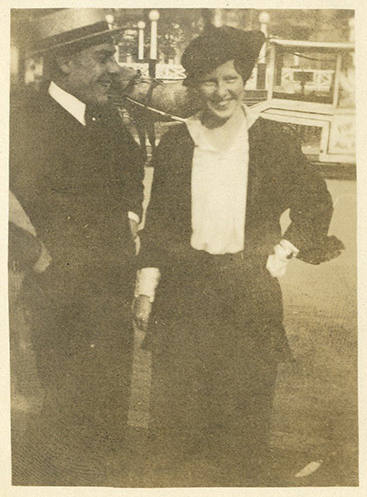 And this sweet picture labelled Palmer Hargrave and Louie. 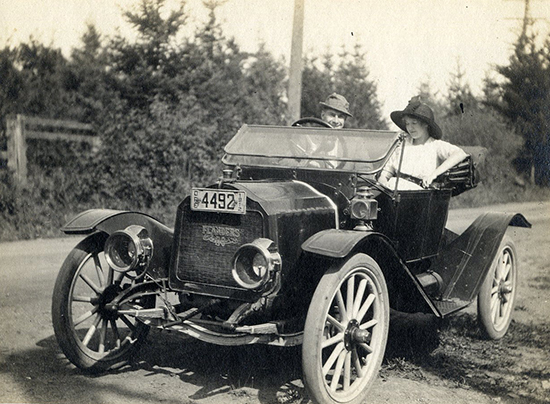 The license plate is from Oregon for the year 1912. And this one which looks like a fun day out with his girl. As was true with so many young men of this era, days of easygoing fun and carefree laughter were brought to a halt as the Americans joined the war in 1917. Jack joined the Army, serving as a gunner in an airplane. Here is a picture of Jack in his uniform. 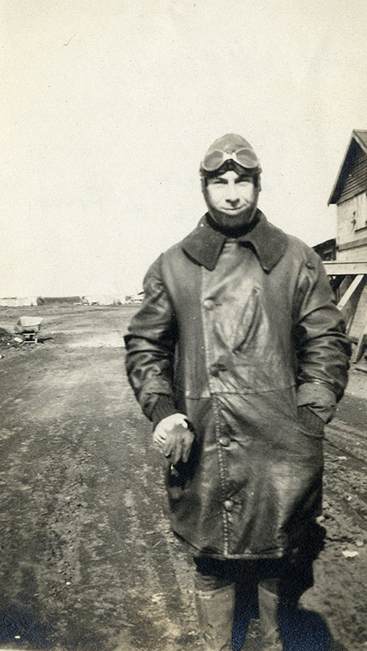 The next image is of Hargrave in his flight gear below. 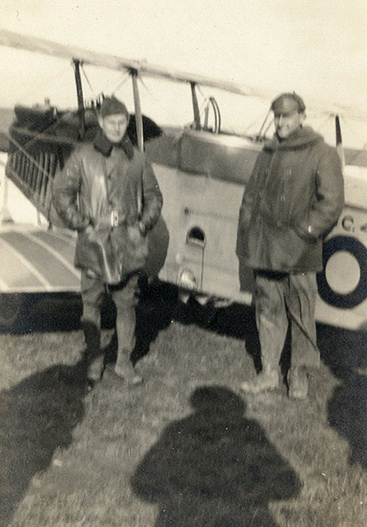 Below that is Hargrave on the left and his pilot on the right, with their plane. 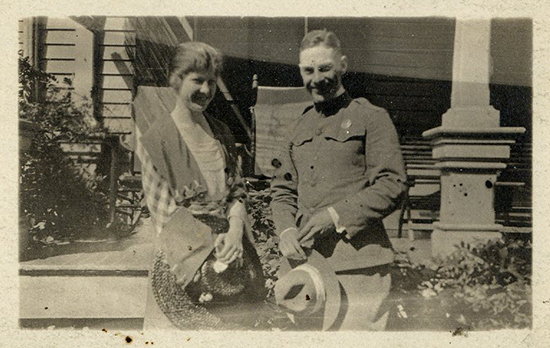 In Crawfordsville in June of 1918, Jack married Anna McCabe, a graduate of UC Berkeley. She lived across from campus on College Hill, her father too was a Wabash man. Palmer and Anna had two daughters, the youngest, Marian, sent the football charm and family photos. The other sister, Janet, followed in her father’s footsteps and was a flyer in WWII. She ferried transport planes as a member of the Women’s Auxiliary Ferrying Squadron of the WASPS. The next image is undated. After the war, Jack and Anna settled in the West for good. First in Portland, later moving to Los Angeles. It was there that they made their life and raised their daughters. 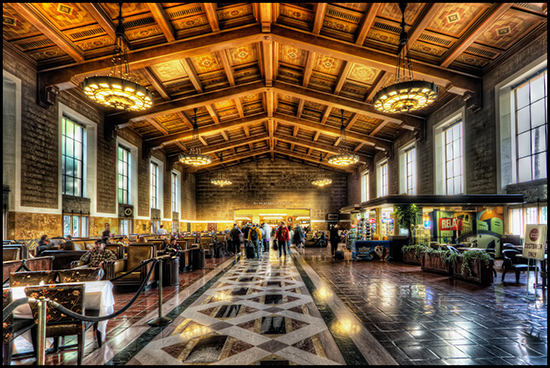 Opened in 1939, the station is on the National Register of historic places. One of its truly iconic features is the lighting. Palmer Hargrave is responsible for the gorgeous fixtures. 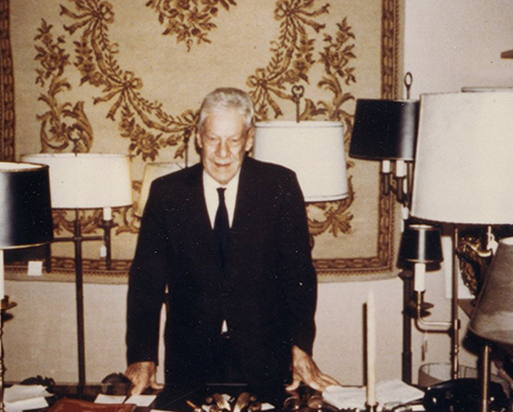 In 1946 he bought a lighting business and Palmer Hargrave became the name synonymous with high end elegant lighting fixtures. To my surprise, it still is! Google the name and you will see hundreds of results in lighting. His legacy of taste and style persevered. Here is an elegant picture of Jack, unfortunately it is not dated. Reminds one of an old style movie star. Very nearly swashbuckling in appearance. Here is another picture of Hargrave, happily this one IS dated, 1965. And what a beauty of a station wagon. 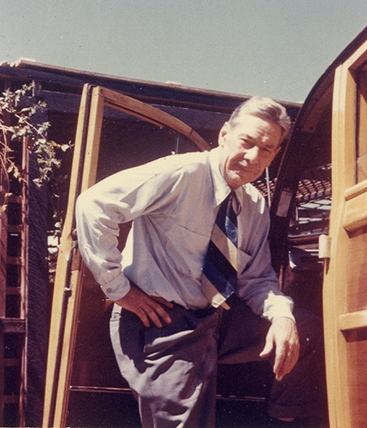 This photo was taken in 1969 and shows Hargrave amidst several of his beautiful creations. It seems that Palmer “Jack” Hargrave was one of those truly good guys that Wabash sends out into the world. Hargrave was a hard worker with an ability to focus. A cheerful fellow with a true and abiding love for his family. This next scan is clear evidence of both of those qualities. 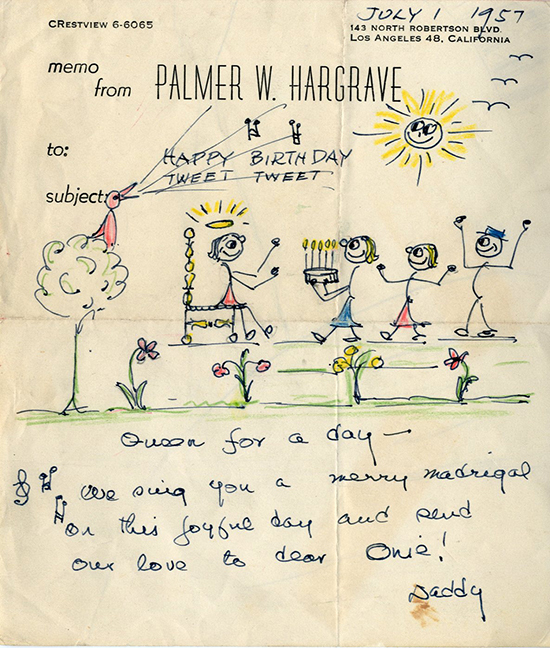 This sweet letter, to his daughter and now in the Archives, still delights 62 years later. What a family, what a fellow, what a story!